When DeeDee-Sims posted their separated version of Amaryll's AM to AF pajama conversion, I decided to stick a pair of Amaryll's sneakers onto the mesh for the very comfortable pajamas-as-daywear look. I also went a little bit wild with recolors. 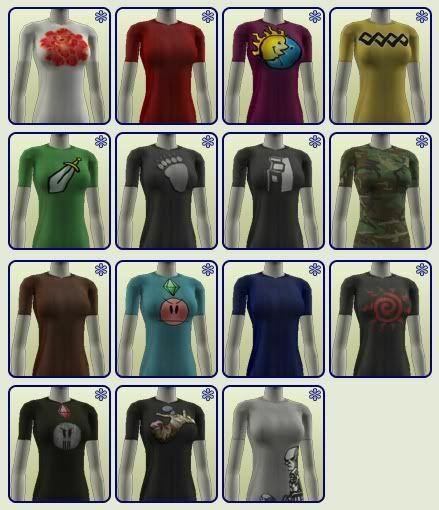 There's seven Maxis colors (the five basegame and two Uni ones), five from Well Dressed Sim (as seen in the EM Pajama conversion that I did), and eleven from njrsims wonderfully colorful collection (seen here and here). There's a fat morph and it's all been compressorized. I can't resist a bad pun. 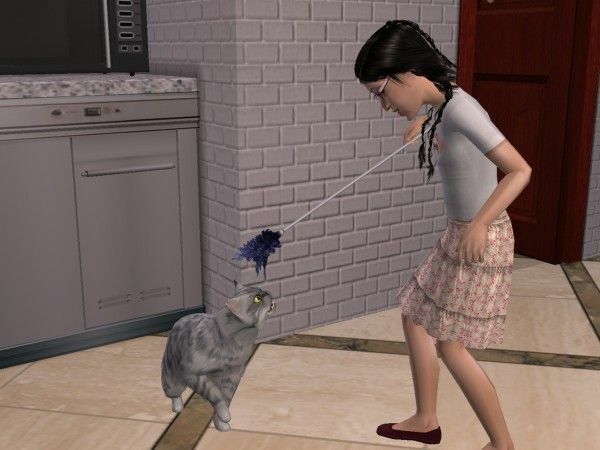 I've also wanted something like this for my Strangetown's Olive for a long time, but no one had made such a mesh before! There's only three recolors (one featuring a bikini by Noora set as swimwear, and two featuring underwear by Xandher set as undies and pjs) and the mesh clips a little goofy with certain animations/hair, but it does feature both a fat and a pregnant morph. Huzzah! Download: Six Posters on "Pineapple"
I decided to convert Hydrogene's wonderful "Six Women Who Changed Science. And the World." minimal posters for the Sims 2. They're on "Pineapple," which is a little pricey, but has an awesome "framed poster" look to it. I also decided to convert Pyxis's AF pajamas for TF and EF. The teen version is shown, modeled by Sharla Ottomas. While Remi has already extracted the hidden Maxis hickies, she binned them as "costume make-up" and enabled them for only teens up to adults. I decided to bin her/Maxis's textures as make-up and enabled them for teens through elders. Eduie made a set of AF pajamas for Garden of Shadows' January 2012 theme and I noticed that four of them would fit on an EF mesh from Parsimonious. So, I did the necessary copy-pasting to make it so. After all, it seemed a shame that the elder ladies were missing out on such pretty nightclothes. They're modeled by Widespot's formerly-late Angel Hart, shown with her eldest daughter Candy's younger daughter Avery Mann. I decided that the Widespot elders needed more pajama options, so I set about to converting some of kaputt-geliebt's AF pajamas and the AM aspiration-themed pajama pants fromWell Dressed Sim.I also added a CAS family to the neighborhood and, since Maxis neglected to give the elder males any tank tops, converted the nine basegame AM tank tops. "Bombshell" is modeled by Daytona Beech, whose son Hamilton hasn't yet figured out that his mom rarely pulls her punches. It's one of many things Hamilton hasn't figured out. "Tanks for the Memories" is modeled by Curly Mint (a CAS creation of mine), shown with his daughter Starlight. All files have been compressorized. Unlike similar pets -- such as Mr. Bigglesworth, M.A.D. 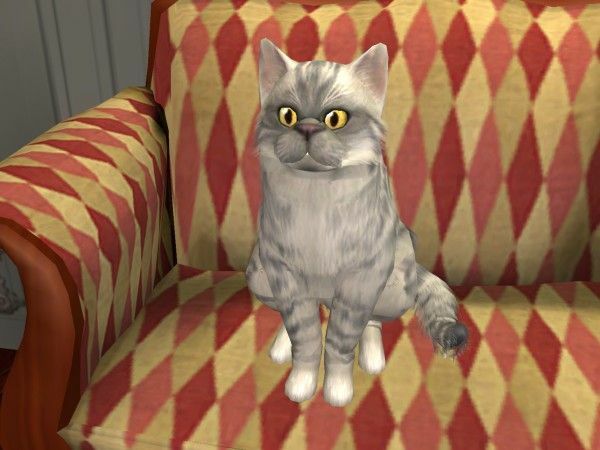 Cat, and Blofeld's nameless cat -- Doomsday doesn't function as a mere accessory for dramatic speeches and dastardly threats: she's her human's partner in crime. She's currently working as a mole in the Widespot Police and, while she cannot communicate what she's seen (though the little video camera mounted on her collar says plenty), she does excel at tampering with any evidence that could potentially make life unpleasant for Rich. In the thread at MTS about Widespot, Peni said: "Doomsday is a world-class cat; I wish I could bundle [her] up with the neighborhood for everybody to use!" She's an adult cat and her personality stats are as follows: Genius, middle activity level, Friendly, Aggressive, and middle cleanliness level. 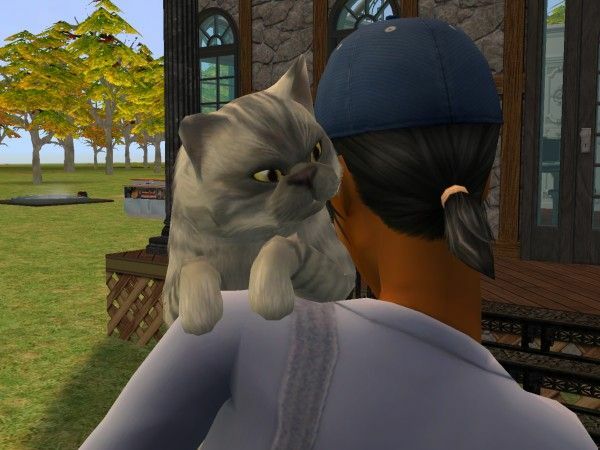 I playtested Peni Griffin's Widespot neighborhood and the number of awesome elder sims in it has made me realize something: Maxis didn't provide its elderly sims with much in the way of clothing choices, even with nearly all of the stuffpacks and expansion packs installed! There's not a whole lot of CC for them, either, and what does exist usually doesn't use the elder bodyshape (or it uses a "fixed" version of it). So I decided to convert two sets of AM and AF underdrawers using the Maxis elder meshes. And, since the Widespot elders really brought this problem to light, I decided to have some of them star in the preview pictures (instead of my small crew of Strangetown elders). The first set is made from 17 of Plum's AM Boxers. It's modeled by Valentine Hart, with a little help from squeezably-soft Mary Land. The second set is made from MissTiikeri's AF Undies. It's modeled by Lana Mann, who's accompanied by her husband Rich. Jason Larson was sporting a rather nasty-looking burn in my game, a left-over of his and Jodie's narrow escape from the house fire that claimed their parents. I decided to make a healed-over version of that burn using Bruno's original alpha and a flipped version of kativip's "Aden" skintone. I really like Koti's Wildfox swimsuits, but I don't use sexyfeet meshes in my game. So, I put the textures and a slightly-edited alpha onto the Maxis AF swimsuit mesh and made a teen version as well. Ajay Loner came to Strangetown to find himself and, in his soul-searching, he also found t2suggas's little green dress. Since he rocks the frock, I decided to go back to the dress's H&M roots and make three all-Maxis recolors. 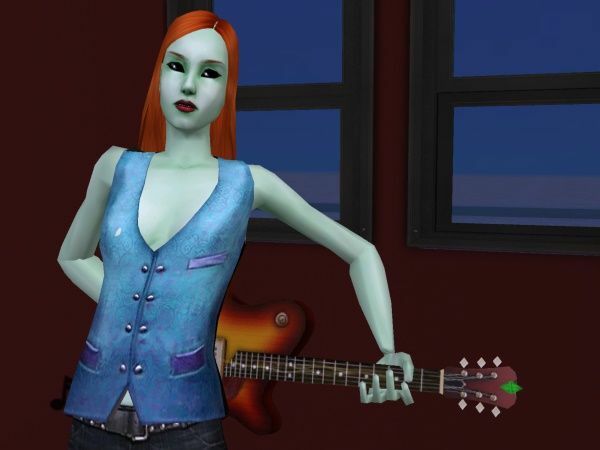 Since I overuse Alkaloid's forest green nose freckles on my green alien sims and Pooklet's "Heart Swells" freckles on my human sims, I decided to cross the streams and use the base of Alkaloid's freckles and Pooklet's alphas to make some more freckles for little green men and women. I realized that the tanktop/boxer TM underwear texture would fit great onto an old SimChic mesh. I'm going to make a Maxis version next, but I decided to convert this colorful set of TM underwear/PJs by Unique first. 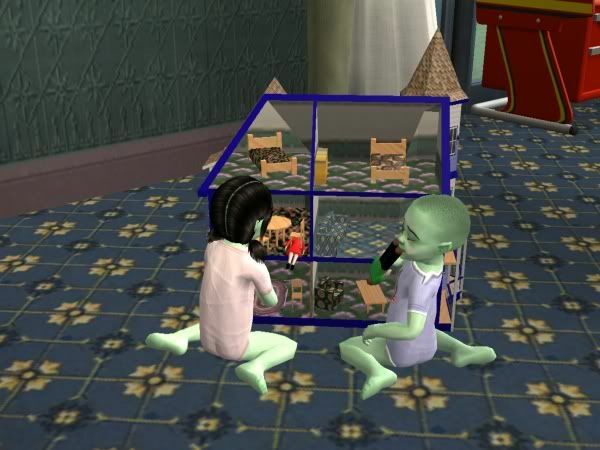 Maxis aliens have blue gums, zombies have grody teeth, and elderly human sims have yellowed versions of their once-youthful choppers. But why stop with just what Maxis gave them? With this set of four teethmasks, the possibilities are there: a zombie can have a Colgate smile, the young expresso-addicts can wear stained teeth, sims like Jill Smith can have a smile that's simply out of this world, etc. I was futzing with the objects files for basegame and found the textures used for the toy dollhouse. 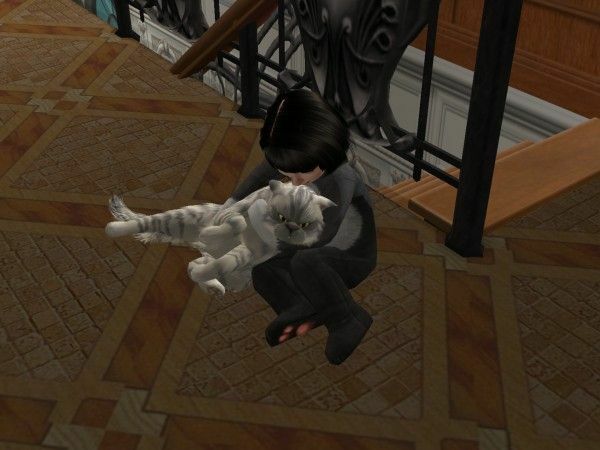 They're a little low-res, but I thought they'd be fun to convert for use in simhouses.